A poet, a women’s rights activist, and an expert on moral and natural philosophy, Lucrezia Marinella (1571-1653) was known throughout Italy as the leading female intellectual of her age. Born into a family of Venetian physicians, she was encouraged to study, and, fortunately, she did not share the fate of many of her female contemporaries, who were forced to join convents or were pressured to marry early. Marinella enjoyed a long literary career, writing mainly religious, epic and pastoral poetry, and biographies of famous women in both verse and prose. 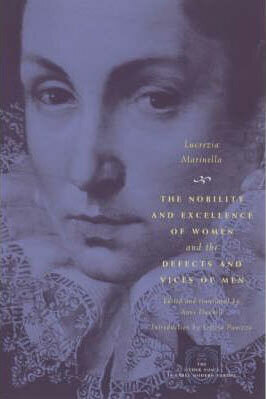 Marinella’s “The Nobility and Excellence of Women, and the Defects and Vices of Men” was first published in 1600, composed at a furious pace in answer to Giusepe Passi’s diatribe about women’s alleged defects. This polemic displays Marinella’s knowledge of the Italian poetic tradition and demonstrates her ability to argue against authors of the misogynist tradition from Boccaccio to Torquato Tasso. Trying to effect real social change, Marinella argued that morally, intellectually and in many other ways, women are superior to men. Available to purchase as an eBook from Amazon and Google Books.